Your car is Japanese. Your beer is German. Your wine is Spanish. Your democracy is Greek. Your coffee is Colombian. Your tea is Chinese. Your watch is Swiss. Your fashion is French. Your shirt is Indian. Your shoes are Thai. Your radio is Korean. Your vodka is Russian. My car is စက္မွဳဇုန္.My beer is Myanmar. My wine is Pyin Oo Lwin. 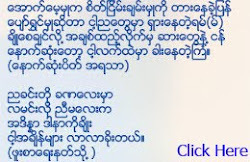 My democracy is လႊတ္ေတာ္. My coffee is Super. My tea is Hi Tea. My watch is China. My fashion is ပုဆိုး. My shirt is အထည္ခ်ဳပ္.My shoes are Mandalay slipper. My radio is Mandalay FM. My vodka is BE.